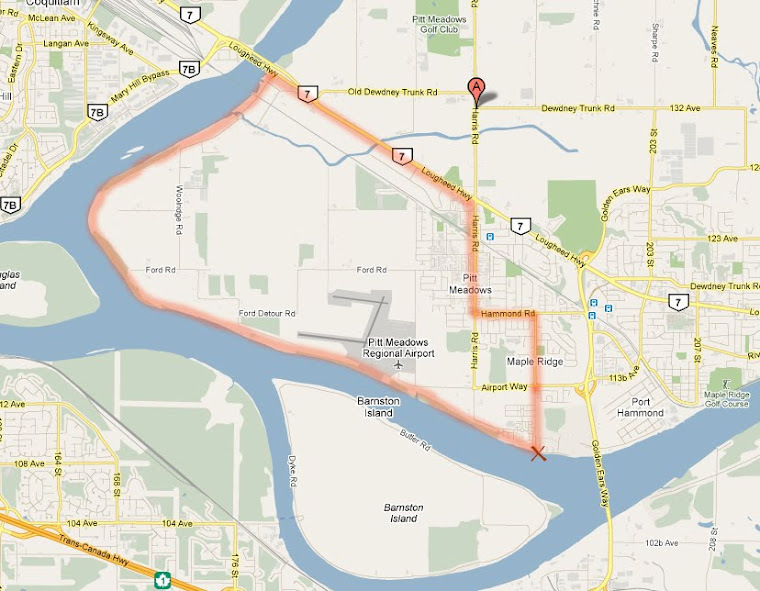 Maple Ridge/Pitt Meadows Cyclist: Maple Ridge Cycle has moved! Maple Ridge Cycle already moved 2 months ago, but I've been too busy to write about it. Owner Troy has had some time now to get things organized, so today was a good day to go see his new store and talk to him. I hope he's going to put up a bigger sign outside the store, because if you're not paying attention and you don't know where it is, you'll walk right past it. For those of you who haven't been there yet: it's just around the corner from the old bike shop, just south of Lougheed at 11771 Fraser Street, between 224th and 225th Streets. This move must have brought back lots of memories for Troy, because he told me he's been digging up some history of the old store. He said it all got started with Griffin Bros. in the 50s, who sold not only bikes, but also lawn mowers and pedal scooters. 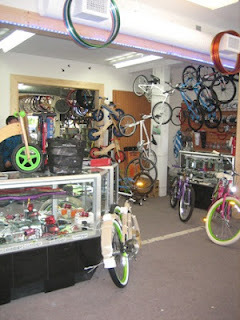 The store was renamed Maple Ridge Cycle in 1967. It's been at its previous location on Lougheed Highway since 1981. 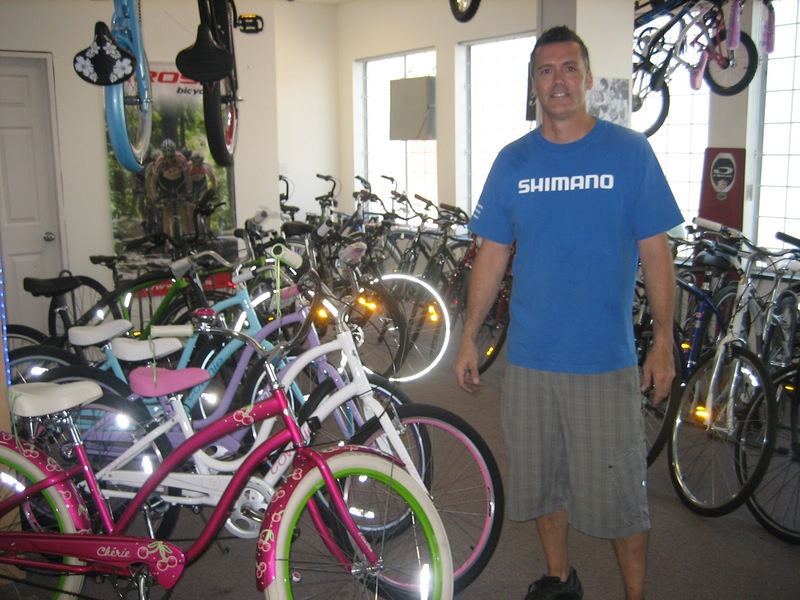 Troy started building bikes at Maple Ridge Cycle when he was only 10 years old. Now the owner of the shop, he has a 5 year old son, who some day might follow in his footsteps. When the building changed owners recently, Troy decided it was a good time to move to a cheaper location. Troy says he sees his shop as a community bike shop, a place where you're involved, where you're "part of the team". As we were talking, customers kept coming in. He knew them all by name and they were obviously regulars. I can see what he means by "community bike shop". Troy's goal is to turn non-cyclists into cyclists. He's actually got a "stepping stone" strategy to make that happen. He starts getting people excited about bikes by offering cool cruiser bikes in bright colours. Those are good for short distance rides in town. Then, when they want to go for longer rides, they feel that the cruiser is a bit too much work, and they'll move on to the next step: the lighter hybrid bike. The hybrid may be just what they'll ever need, or some of them may get interested in road bikes. There are more bikes in the back of the shop. Just walk right in. Troy has lots of plans. Once he has everything in his shop set up just the way he wants it, he wants to start organizing neighbourhood rides, and he'll be offering bike mechanics courses. I'll be the first one to sign up!